MUSYNX wastes no time getting you into the mix, sporting a simplistic UI with not much in the way of menus outside of an “Options” and “Manual” and instead taking you straight to the available tracks that you can scroll through. 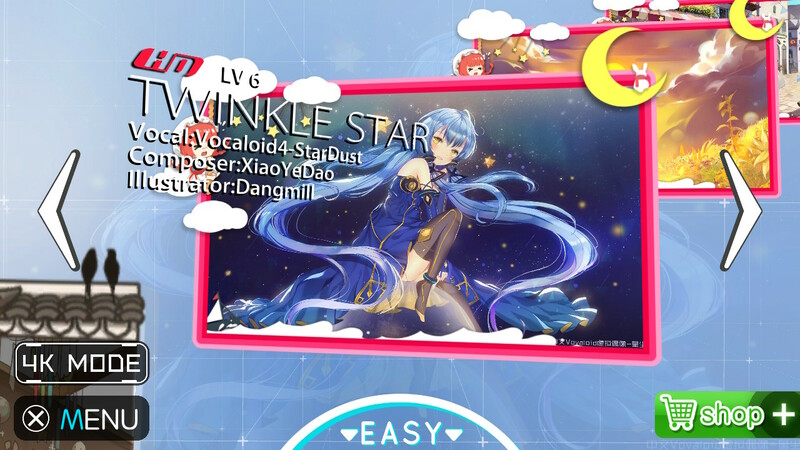 Though they’re not defined as such, depending on the genre of the track, each will have a specific stage to help compliment the mood and give MUSYNX some visual flair as well. I think it shines pretty well in this department, sporting a simple, clean, yet attractive scenario in which the notes you interact with become a lot more fun and a give it all more panache. Some stages look like you’re traveling through an Ethernet cable, another has an almost space ship vibe, another that’s more water color-esque with a Chinese aesthetic. My personal favorites involve stages that take place in a 16-bit cafeteria where the notes turn into dishes coming down a conveyer belt with sprites on the bottom of the screen where the button prompts are reacting to every single note you hit. I like this a lot because it helps give the songs a “look” instead of being something that’s just heard. It took me back to the days of Dance Dance Revolution where every song was accompanied by a complementary visual backdrop – whether they’re music videos, abstract visuals, etc. – making the entire experience come together and be entertaining even for those just watching. 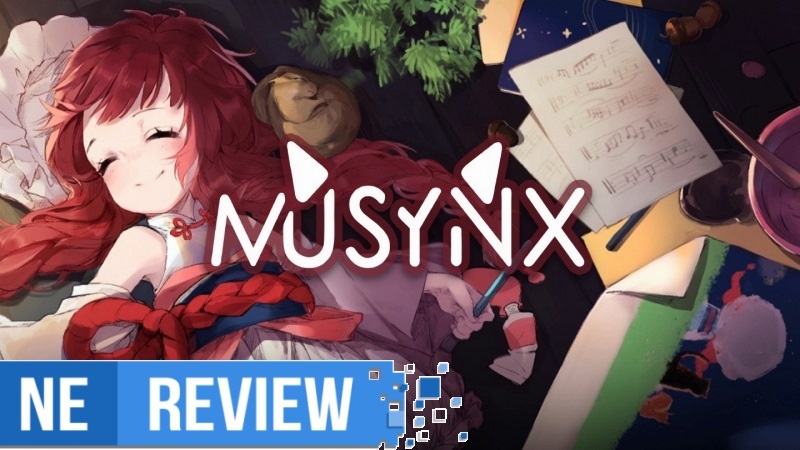 MUSYNX does a lot of neat things with its presentation to help make it stand out from other rhythm games, and the accessibility of it makes it all the more appealing. When selecting a song, you can choose the style of Sound Enhancer you’d like – “Auto”, “Strong”, “Weak”, and “Off”. Sound Enhancer determines how much your accuracy will effect the music being played, so if you miss a lot you’ll hear nothing at all or some instruments will be missing, etc. In addition to the Sound Enhancer, you’ll have a choice of how fast you want the notes to come down. 1.0x is obviously the standard, and it goes all the way up to 9.0x, which is faster than anything has the right to be – you may as well be playing with your eyes closed at that point. Having the choice of speed is nice for those that feel a song may go too fast or too slow, and gives players the option to tweak the speed to be a more optimal experience for the person playing. I personally like to stick to anywhere between 2.0 and 4.0, but there were definitely some songs where I had to go either well below or higher than my threshold of comfort in order to make a song more accessible. It’s a great way to train your reflexes but also get used to how some songs and genres work out. The tracks themselves give you a hint before selecting as well as when you’re in Easy or Hard Mode, every song has an assigned Level that gives you an idea of what you’ll be working with. Some songs are so frenetic that they’re labeled as “Level ?”. Seriously. What I find appealing about MUSYNX is not only the fact that it has tons of songs to choose from – nearly 100, in fact – but you can switch between 4K and 6K modes. This has nothing to do with resolution, but instead adds additional inputs to songs. Where 4K you’ll be mainly utilizing the Left, Up, X, and A buttons, 6K also adds Down and B. For those who may not be too confident in their button pressing potential or maybe find it slightly confusing or uncomfortable with the way the Joy-Con are shaped, MUSYNX is also entirely playable as a touch-only experience. At first I was playing a good amount with the Joy-Con, but since the d-pad isn’t a true d-pad and is under the left joystick versus above it, I found it a little uncomfortable after a while, and the lack of symmetry would mess with my brain sometimes midway through some tracks. Thankfully, the touchscreen is extremely responsive, and this became my preferred way to play. I found my fingers to be quicker with the taps, and holding only the tablet in my hand without the Joy-Con obstructing it was a surprisingly fun and comfortable experience. It was especially helpful during some songs where notes would slide from left to right and right to left and go in multiple zig-zag directions. The only issue I truly found with the touchscreen is that, as responsive and great as it is, for some reason when you’re scrolling through the track list and you want to select it, a simple tap on the screen won’t do it. I have to tap a number of times before it decides “oh, right, you’re selecting this” before it finally would take me to my Sound Enhancer and Speed customization right before the start of the song. With the Joy-Con all you have to do is press A and you’re good to go. I’m not sure what the problem with that is, as everything else from the scrolling to the in-game presses, to menus and everything else are perfectly fine, but tapping on the screen to select the song you want is a struggle. 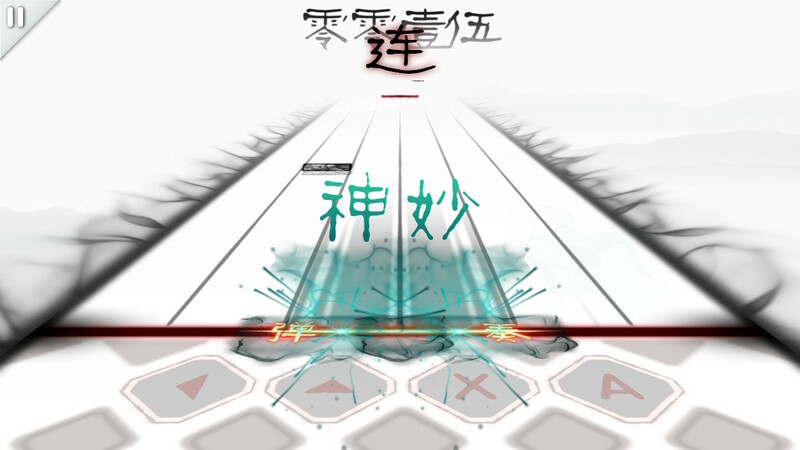 One of the more frustrating parts of MUSYNX is that with so many great tracks, you’re going to want to replay some again either to beat your high score or simply enjoy the track a number of times. Unfortunately, there isn’t an option to filter through or favorite the tracks that you like the most. While simple, the nature of scrolling through what feels like a never-ending amount of tracks can get tedious, especially when you know what you’re looking or are in the mood for. Outside of some basic filtering, favoriting, and a current lack of store selection (which I’m sure will come soon after launch to increase the already eclectic palette the game has), MUSYNX is a fantastic rhythm game that’s easy to pick up and play, and while I would highly recommend its portable touchscreen mode versus TV, both work well and provide great visuals on top of catchy, upbeat tunes that’s great for solo play, parties, and everything in between. Rhythm fans should keep their eye out for MUSYNX. 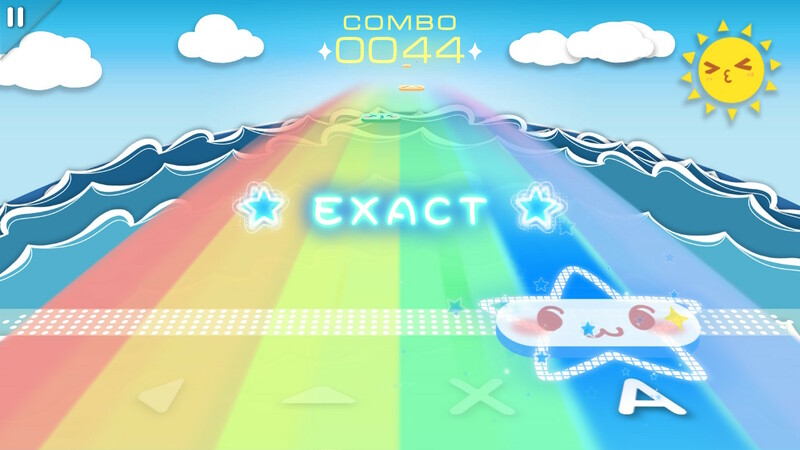 MUSYNX’s diverse track list of energetic, uplifting, and catchy tracks make it stand out as one of the better rhythm-based games to come out in recent years. From tracks across genres like Trance, Metal, Ambient, Synth-pop, Drum & Bass, Chiptune, and so much more, MUSYNX has something for everyone, and those with an eclectic taste will have tons to find and love here, especially with every track having a wonderful illustration to boot. While the 4K and 6K modes may be simplistic in its design offering a 4 or 6-button way to play respectively, going back and forth between Easy and Hard as well as 4K and 6K helps increase the longevity of the game’s already extensive selection by having scores attached to each mode and style of gameplay, plus the ability to add many more songs on the way through a shop. This makes it accessible for newcomers and veterans alike, allowing those looking for a challenge or wanting to get better equal attention in achieving player satisfaction. MUSYNX review copy provided by PM Studios for the purposes of this review.